In 1939, Jimmy Stewart's infamous Mr. Smith went to the nation's capitol in Washington, D.C. and showed Americans through the cinema that one person can make a difference in changing the course of a nation. 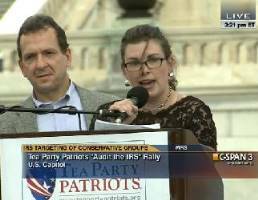 Last week, thousands of common American citizens made their way to our capitol to attempt to hold the Obama Administration and the employees of the IRS accountable for their scandalous, if not criminal, behavior in discriminating against the Tea Party and other conservative patriot groups. The crowd heard rousing speeches from Senators and Members of Congress. They also heard speeches from common citizens who traveled in from across the nation to speak to their fellow patriots. Among those common citizens was my fellow TexasGOPVote political news writer, Kelly Horsley. Horsley is a stay-at-home mother who homeschools her children and helps her husband operate their Chick-fil-A restaraunt located in Houston. She spoke of reacting to an out-of-control federal government during the 2008 TARP spending bill debate. For the very first time, she, like millions of other Americans, called her Congressman and Senators to try and stop the wasteful spending that, in retrospect, had little impact in preventing the economic collapse that followed. "It wasn't about party affiliation or social issues," Horsley told the crowd. "It was about liberty. I heard someone say liberty is messy. I didn't understand what that meant at first, but now I think I get it." "To the IRS and the NSA," Horsley continued. "We here love liberty, and we will not be silenced. Loving liberty shouldn't make you irrelevant to any political conversation. Liberty is not a dirty word." In Proverbs 27:17, it says, "As iron sharpens iron, so one man sharpens another." This is something that can definitely be applied to the church, but what about to the realm of politics? I personally think it can be. Until the 2008 TARP package, I had never picked up the phone to call my U.S. Representative. One September day in 2008, all of that changed. I'm a wife, I'm a mom, I'm a home school mom, a taxpayer, and a full-time volunteer for pregnancy help centers. I have always had moral, unlike the IRS and the NSA, and I definitely don't want the government involved in my personal business. I became engaged and involved in local Houston, Texas area politics, with Houston Tea Party Society and Katy Tea Party Patriots, and started listening to what all of their members were talking about. It wasn't about party affiliation or social issues, it was about liberty, and one of the many meetings I've attended, I heard someone say liberty is messy. I didn't understand what that meant at first, but now I think I get it. I've been sharpened by the liberty movement, by the members involved, and the new media. My opinions and viewpoints have changed dramatically since the day I picked up the phone to dial the White House. To the IRS and the NSA, we here love liberty, and we will not be silenced. Loving liberty shouldn't make you irrelevant to any political conversation. Liberty is not a dirty word. Thank you.